Uninteresting maths experiments, more to do with relation to sound. There is no doubt that the sky is an amazing piece of art. When you look up at the sky in a clear and dark location, the sight of hundreds of stars can literally take one’s breath away. What’s amazing is that in the spaces between the stars and planets lurk more things than you can imagine – nebulae, galaxies, even more stars, and who knows what else which has yet to be discovered! Have you ever wanted to use a telescope or take photos of celestial objects, but never had access to one? Find out more about Harvard’s Observing With Nasa (OWN), a website which allows you access to remotely controlled robotic telescopes, and see what kind of photos you can produce! 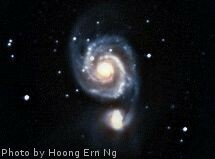 Author Hoong ErnPosted on October 2, 2011 October 2, 2011 Categories Science & TechTags astronomy, astrophotography, image processing, telescopeLeave a comment on Observing With NASA: Remotely controlled telescopes which YOU can use! Sitting in a bus, or a train, or even walking about the streets is always a good opportunity to take a look at other people and to see if they are wearing a wrist watch. Ok, I don’t actually do that often, but it is always an interesting experiment to perform. I’ve recently heard arguments that [wrist] watches are no longer needed, that they are a thing of the past. People will now take a look at their phones to see what time it is, or glance at a clock on the wall. However, I think watches are still relevant in these modern days. Here’s why. Author Hoong ErnPosted on September 30, 2011 September 6, 2012 Categories Nature, Outdoors & Gear, Science & TechTags edcLeave a comment on Do you wear a watch?